Since 1985 New Pig has been the leading brand in leak and spill containment, offering the world’s largest selection of absorbent products to industrial, utility, military and government facilities worldwide. Serving more than 200,000 customers in over 70 countries, New Pig is dedicated to helping customers keep their facilities clean, safe and more productive. The only absorbent mat with Grippy backing that keeps the mat in place. 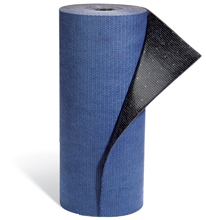 This absorbent mat soaks up leaks, drips and overspray without bunching up, curling or sliding, and peels up easily without leaving residue. The durable, high-traction mat absorbs oils, coolants, solvents and water, and is tough enough for high-traffic work areas, walkways and anywhere slippery floors are a problem. Visit our website to see our complete selection of grippy absorbent mats. 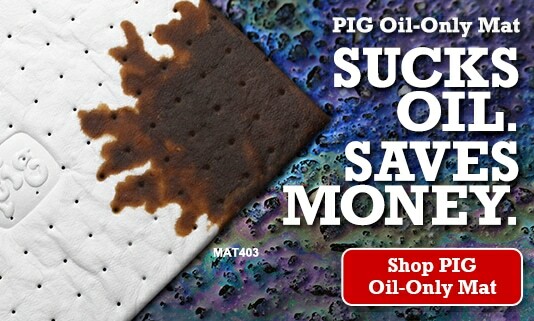 This is New Pig’s most cost-effective absorbent mat when you only need to absorb oil-based liquids. This oil absorbing mat has eight layers of 100% polypropylene that are thermally bonded to make this PIG Mat the strongest oil absorbing mat on the market. It will not rip, tear or fray, even when saturated. It floats to clean up spills on water. And PIG Mats lasts 2 times longer than ordinary mats. Visit our website to see our complete selection of oil absorbing mats. 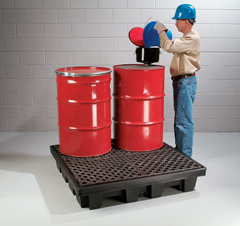 The strongest standard spill containment pallet you can buy for everyday drum storage. 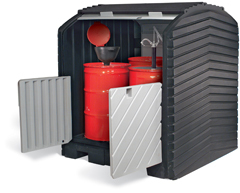 The spill containment pallet’s molded-in sump catches leaks, drips and spills to keep your storage areas clean and safe. 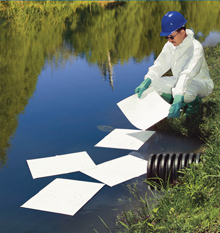 Its low-density polyethylene construction resists UV rays, rust, corrosion and most chemicals. A textured grating adds traction and lifts out for easy sump access. Two-way forklift entry allows easy movement from either direction. Visit our website to see our complete selection of spill containment pallets. Load your drums into New Pig’s roll top hardcover spill containment pallet for all-weather protection and liquid containment. The roll top slides up for easy access to drum tops while the rest of the unit stays closed. Drums can be stored with pumps or funnels in place. Low-density polyethylene construction with UV inhibitors resists UV rays, rust, corrosion and most chemicals. Visit our website to see our complete collection of roll top spill containment pallets. Who is New Pig and what’s with that name? Be the first in line for our best deals, latest products and coolest promos and more!